Although my main weapon systems are located at my Chest Battle Armor, my Battle Transport Platform is almost as important. I remember back at Robot College, my professor began the Transport Platform lecture and I thought it would be easy to its systems. But we spent 3 weeks on the Space Rocket alone! And then there was the emergency repair scenarios to address a failure of the transport mechanism. I was impressed that the Wheel Axles could be quickly swapped out but unless you have Support Assistant ‘Bot at the ready, well you have a big problem! That almost happened to me at the Great Moon Battle which you can read about elsewhere on this website. During that battle, I was confronted by the leader of the fearsome Assembly of Important Robots. I had to make a quick get away to avoid a full yield Yellow Space Rocket. My transport mechanism will only do 3 MPH at best so I had to come up with a quick plan to avoid a Sonic catastrophe. I ended up diving over the side of a steep crater because my Transport System has limitations. To be absolutely honest with you, my slow transport mechanism is the only real flaw in my entire Moon Robot design. Just don’t tell that to the Assembly of Important Robots. Here then, is a detailed explanation of my Battle Transport Platform. We start on the right side at he top and then work our way down to the Starboard Front Bumper Assembly. Then we go left to the top and finish the rest of the systems one by one until we end at the Transport Platform Main Assembly. Rocket Launcher – Powerful spring loaded launcher, requires secondary Support ‘Bot to load and arm. Space Rocket – Hull fins are not for stabilization in Earth air but to disrupt sonic signals in the near vacuum of the Moon. Rocket Payload – Soft end projectile sends terminal vibrations when impacting their target. Port Side Terrain Level Adjustment – Requires Secondary Support ‘Bot to adjust clearance of uneven Moon surfaces. Port Side Wheel Axle – Axle is is robustly in built but will not support a Earth Child standing on it. Axle Access Bay – Portside extra large clearance area to remove and replace axles in the field (when needed). Curved Weapons Scoop – Special design to quickly push enemy ‘bot weapons that have left unattended (Yes, it happens). Magnetic Compass – Counters the Moon’s unusual magnetic deposits and homes in on enemy ‘Bot locations. Sonic Detection Grooves – There are 3 on each side and absorb signals for other ‘Bots for analysis. Axle Access Bay – Starboard side large clearance area to remove and replace axles in the field. Starboard side Wheel Axle – One of the most vulnerable aspects of the transport mechanism. Top speed = 3 MPH. Starboard Front Bumper assembly – Same as the Port Side – this area is extra reinforced to absorb hard contact. Reserve Sphere Bay – Large recessed holding area for Space Sphere ammunition. Lower Pedestal Leg Stand – Connect upper Chest Battle unit with Transport Platform Main Assembly. Anti-Vibration System – Isolates transport mechanism movement to allow precise aims of Upper Chest Battle units. 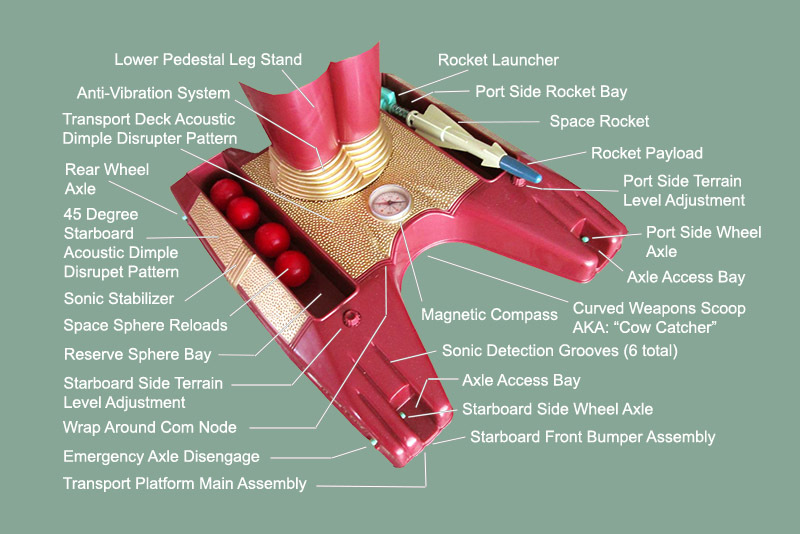 Transport Deck Acoustic Dimple Pattern Disrupter – Confuses and changes sonic signals from enemy ‘Bots. Rear Wheel Axle – Starboard axle at Aft Platform is more vulnerable to damage due to uneven weight ratio. 45 degree Starboard Acoustic Dimple Pattern Disrupter – Targets higher frequency sonic signals and can be invaluable. Sonic Stabilizer – Required to properly filter higher frequencies in conjunction with 45 degree unit. Space Sphere Reloads – Requires Secondary Support ‘Bot to arm as they are drooped into Gun Arm from shoulder height. Starboard Terrain Level Adjustment – Requires Secondary Support ‘Bot to adjust clearance of uneven Moon surfaces. Wrap Around Com Node – Communications systems conduit – connects forward systems to Starboard and Port sides. Emergency Axle Disengage – Although not shown at Port side, this is the rapid unlock area to swap out field axles. Transport Platform Main Assembly – Entire bottom unit is constructed of strongest materials (Plastic) but will not support Earth Children. I sincerely hope that this diagram gives you an appreciation for this great technology. The development of the Moon Robot Battle Transport Platform was a break through for modern day Moon Robots. On Earth, war is waged by the use of physical impact. However, on the Moon – Robots engage in conflict by utilizing subsonic signals or interstellar waves to disrupt and even harm the enemy. Even though the Moon’s surface is a vacuum and contains no air for sound to travel, subsonic signals are in a special category that only Moon Robots can detect. There is no Robot killing, just severe sonic disruptions of Robot life systems which mimic long periods of inactivity. Yes, I guess that is kind of like being dead (but only for a while). We Robots fear those long period of inactivity just as much as you Earthlings fear your kind of death.